CADAC has announced a restructuring of its operational management at its Bedfordshire headquarters, intended to accelerate growth and product development and include the appointment of David Kan as CEO and Nick Fletcher as director of research and development. (L-R) David Kan and Nick Fletcher. David Kan joined Soundking Europe in 2009 with a business management background in Malaysia and the UK. He has held the position of general manager and acting director of R&D for the past two years. During that time he has worked closely with the product development engineers at CADAC, evolving the lines of communication and cooperation between Luton and Ningbo. In his new role he will continue to manage and strengthen the relationships between the two sites, in order to accelerate product development and provide CADAC with unfettered access to engineering and production resources at Ningbo. Commenting on the new appointments and future development plans for the company, Kan stated, "Over the last few years I have been closely involved in strategic planning at senior management level, both here at CADAC and at our parent company Soundking. This has placed me in a unique position to assist in determining the future development of CADAC. 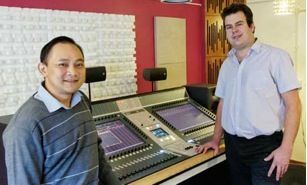 It is our absolute commitment that the CADAC legend should not only live on but thrive as a world class manufacturer of the best sounding and best operational mixing desks. At the heart of this strategy lies the design and engineering heritage here in Luton, but in today’s highly competitive markets the vast manufacturing resources of our parent group provides resources that enable us to realistically challenge current industry leaders across the breadth of sound reinforcement sectors. “Following through from the huge interest in and demand for the new CDC Four and CDC Eight consoles, CADAC will continue to expand its product development, pressing ahead in the digital console market; and we will see further growth significant in development investment moving into 2013. Our growth projections and product development schedule are set for the next three years, and I am re-positioning some of my key staff to put us in the best position to meet these objectives. “This is an exciting time for CADAC, especially given that 2013 is our 45th anniversary. I think I speak for everyone in the company when I say that what we have set out to achieve in the coming years is going to make us as proud as we justly are of our heritage." Chief among Kan’s appointments is that of Nick Fletcher as director of research and development. Fletcher has been a member of the CADAC engineering team for over 20 years, originally joining the company as a test engineer, going on to become a console design engineer and working closely with co-founder Clive Green on the design of the legendary J-Type, F-Type and R-Type consoles. He designed the CADAC S-Type; the company’s current large-scale analogue console. Most recently, he has led the design of the LIVE1 compact analogue and CDC Four compact digital consoles. Fletcher’s broad experience within the company and leadership of these major development projects made him the ideal candidate to lead the ambitious product development schedule now in place, according to the company.